Defence Minister Manohar Parrikar today commissioned ‘INS Chennai’, the third indigenously designed guided missile destroyer in the Kolkata class. The Kolkata class (Project 15A) are a class of stealth guided missile destroyers constructed for the Indian Navy. The class comprises three ships – Kolkata, Kochi and Chennai, all of which are being built by Mazagon Dock Limited (MDL) in India, and are the largest destroyers to be operated by the Indian navy. Construction of three Kolkata-class ships was sanctioned by the Government of India in May 2000, and steel for the lead ship was cut in March 2003. 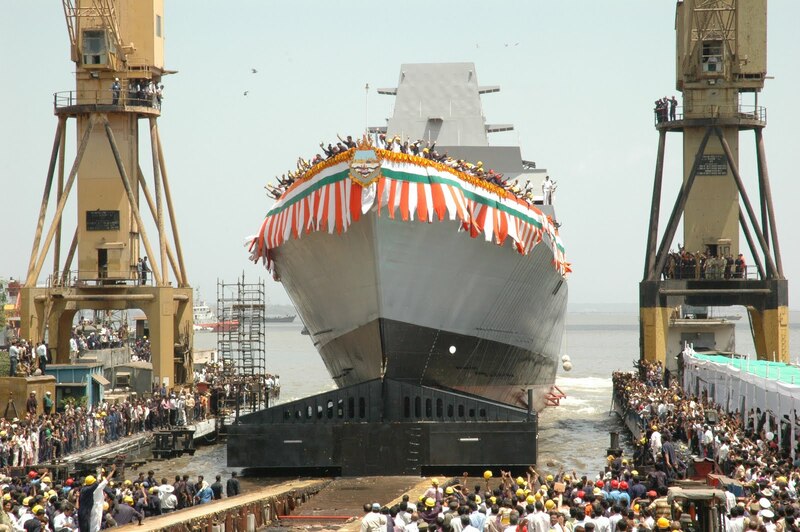 Construction began in September 2003 at Mazagon Docks, Mumbai, with an initial expectation that the first of the class would be handed over to the navy by 2010. However, since then the Kolkata class has suffered consecutive delays, slow construction procedures and technical problems which saw the first ship of the class enter service during mid 2014. The delays in the construction programme have been attributed to persistent design changes made by the Indian Navy to incorporate new weapons systems and sensors, failure by a Ukrainian shipyard to deliver the ship’s propellers and shafts and the contract later being awarded to a Russian firm, and finally the delay in the delivery of the Barak 8 anti-air missiles, which are still in the final stages of completion with Israel Aerospace Industries and the Defence Research and Development Organisation. The Kolkata class share similar dimensions to the previous Delhi class, however they have 2,363 modifications which include major upgrades in weaponry, sensors and helicopter systems. These are the first stealth destroyers being built by India and marked a significant development in India’s shipbuilding technology. The ships would incorporate modern weapons and sensors, and will have an advanced information warfare suite, an auxiliary control system with a sophisticated power distribution architecture, and modular crew quarters. INS Chennai, a P-15A Guided Missile Destroyer, was commissioned into the Indian Navy by the Hon’ble Raksha Mantri Shri Manohar Parrikar at an impressive ceremony held at the Naval Dockyard, Mumbai on 21 Nov 16. The event marks the formal induction into the Navy of the third and the last of the three ‘Kolkata’ class destroyers, indigenously designed by the Indian Navy’s in-house organisation, Directorate of Naval Design and constructed by Mazagon Dock Limited, Mumbai. On his arrival, the Hon’ble Raksha Mantri was received by Admiral Sunil Lanba, PVSM, AVSM, ADC, the Chief of the Naval Staff and was presented a Guard of Honour by the ship’s crew. The ceremony was witnessed by a large gathering which included several dignitaries and senior officials from the government and all three services. 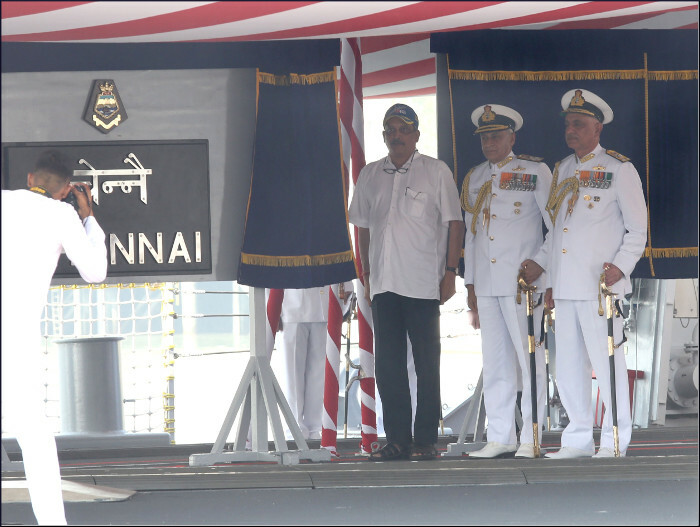 Hon’ble Raksha Mantri Sh Manohar Parrikar, whilst addressing the gathering, termed the commissioning of INS Chennai, last of the Project P-15A class Destroyers, as a historic day for the Indian Navy as it adds another milestone in our relentless journey towards achieving self reliance in battle readiness. The ship represents a significant ‘coming of age’ of our warship building capability and defence preparedness, said the Defence minister. He further stated that the Indian Navy, in addition to providing overall maritime security to our country, also plays a crucial role as the ‘net security provider’ in our adjoining seas. In this regard, Shri Manohar Parrikar also stressed that the Navy’s growth and development must keep pace with the nation’s growth and maritime security needs. 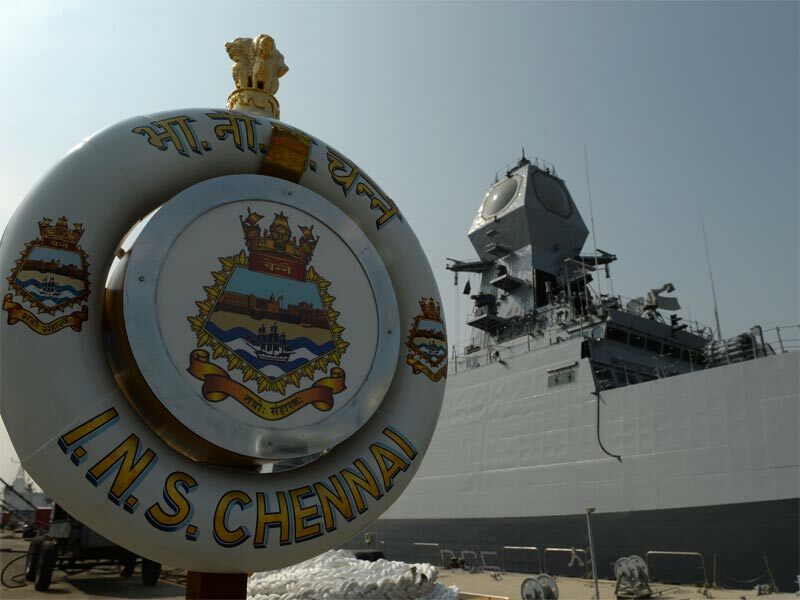 During his address, Admiral Sunil Lanba, the Navy Chief said that commissioning of INS Chennai marks another milestone in the Navy’s quest for self-reliance as it signifies completion of the challenging Project P-15A and heralds a new era of advanced warships built indigenously by Indian shipyards. The Admiral also stated that indigenisation of platforms, weapons, sensors and equipment with participation of public as well as private sectors, will continue to remain a focus area of the Indian Navy, in line with the ‘Make in India’ policy enunciated by the Prime Minister. He emphasized that the ‘Roadmap for the Navy’s expansion and growth would continue to remain firmly anchored on Self-reliance and Indigenisation’. The Commanding Officer, Captain CR Praveen Nair, read out the Commissioning Warrant, which was followed by the hoisting of ‘Colours’ (ceremony of hoisting the National Flag and Naval Ensign) which marked the commencement of the ship’s service as a warship of the Navy. The Commissioning event was characterised by closely coordinated sequence of drills and events leading to formal unveiling of the ship’s name plaque by the Chief Guest. On completion of the Commissioning Ceremony, the Hon’ble Raksha Mantri also unveiled a special cover to commemorate the Commissioning of INS Chennai and completion of the prestigious Project 15A class of stealth destroyers. INS Chennai is packed with contemporary and sophisticated ‘state of the art’ weapons and sensors such as Surface to Surface Missile(BrahMos) and Surface to Air Missiles(Barak 8). The ship is fitted with a modern Surveillance Radar which provides target data to the gunnery weapon systems of the ship. The ship’s Anti Submarine Warfare capabilities are provided by the indigenously developed Rocket Launchers and Torpedo Launchers. The ship is equipped to fight under Nuclear, Biological and Chemical (NBC) warfare conditions.